This package contains two 300ml bottles of OPTI-FREE Replenish solution for cleaning and storing your soft contact lenses. It's designed to provide greater comfort of wear and includes two antibacterial lens cases. Opti-Free Replenish multi-purpose solution is intended for cleaning soft contact lenses. It was developed by Alcon based on the original formula of its Opti-Free Express solution. The new Opti-Free Replenish solution is an improvement on the original solution thanks to some additional cleaning ingredients. The technological innovations of Opti-Free Replenish focus mainly on the preservation and moisturising of lenses to provide greater comfort. The package contains two 300 ml bottles of solution and two contact lens cases. Opti-Free Replenish is also offered in different sized packages, including 120 ml, 300 ml and 3 x 300 ml. Opti-Free Replenish works with the lens material, which is then able to keep a thin layer of the tear film on the lens' surface all day long, thus ensuring hydration. Lenses cleaned with Opti-Free Replenish remain moist and comfortable throughout the day. The TearGlyde regeneration system works on the lens during its storage in Opti-Free Replenish solution and affects the lenses‘ ability to absorb water. The lenses are then able to utilise the moisture of the natural tear film of the eye. This helps to reduce feelings of discomfort associated with dry-eye syndrome and red eyes. 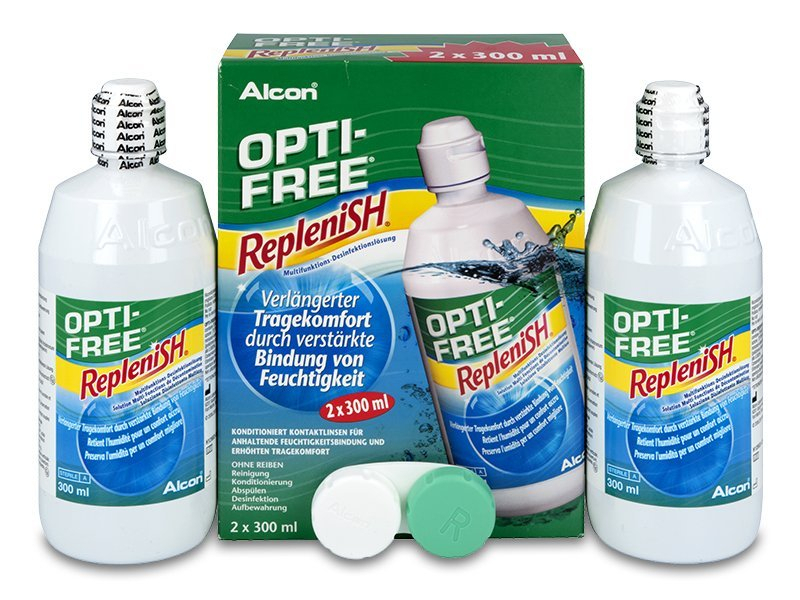 Using Opti-Free Replenish helps to improve comfort for users of soft lenses who feel discomfort during long-time wear. Opti-Free Replenish has been developed for use with lenses made from modern, silicone-hydrogel materials, including PureVision, Acuvue OASYS and Biofinity, but it is also acceptable to use with traditional hydrogel contact lenses.